Please select the length you need. We will send you the appropriate connections and power supplies based on the length that is ordered. If you are unsure what you need this is the easiest way to order. Please click on More Details for a better idea of what you will get in a complete system. Control on/off, color, brightness, and flash settings with your Android phone over your home wifi network. 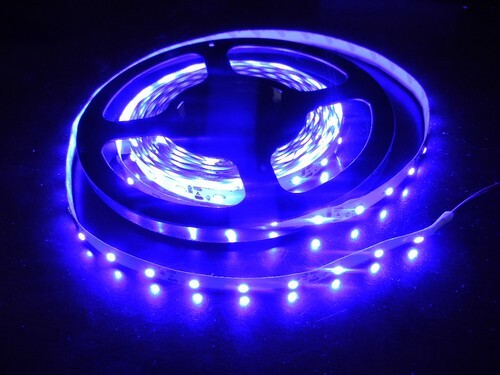 You can even make the lights sync to the music you are playing on your smart phone. White is included as one of the colors. This kit allows you to have RGB LED lights flash, fade, or stay a solid color. Plug right into your home wall outlet and attach your LED RGB strip - Plug and Play - easy installation. With this kit you have the option to choose any shade of colors to stay solid white, flash, fade, varying brightness. This kit comes with a full function wireless remote to control the unit. This DIY LED kit is energy efficient and gives off very little heat. This kit has 3M tape on the backside of the led strips so it can be easily be installed under cabinets. The kit does not include 3m 94 primer. If you plan to use the 3M tape to hold the lights in place you should also consider the 94 primer.